Most skateboards are laminated from thin sheets of 1/16″ veneer that are stacked one on top of another with glue between each layer. The veneers are then pressed in or on a mold. 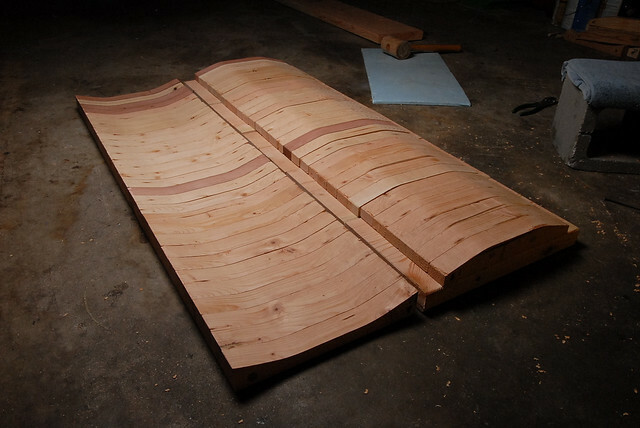 Usually the veneer in a seven layered skateboard are configured as shown below. Depending on the boards’ use, extra layers can be added or subtracted from this configuration. A typical configuration would be similar to below. 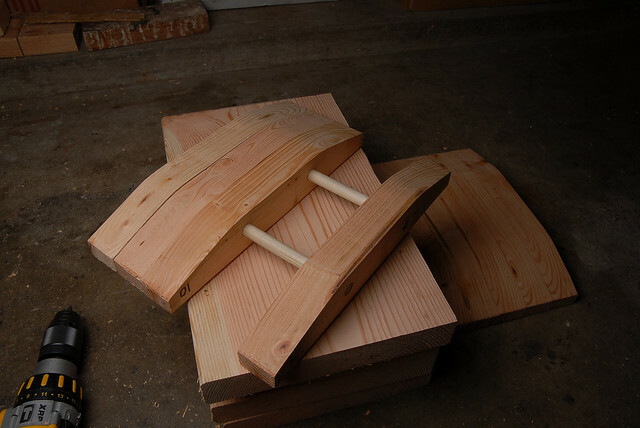 There are many different types of presses that can build a skateboard. Below are examples of a number of presses used. Very expensive to buy and operate. Molds are milled from aluminium and are costly. Not really an option for a small start up company. Can be custom built to suite different board configurations. Expensive but within a price range of an experienced home board builder. Can be built using local materials from a metal scrap yard and automotive supply retailer. Board design has to be well thought out. Molds can be expensive and time consuming to build. 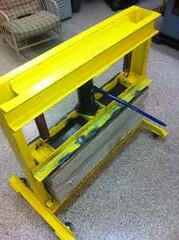 You need to be handy with metal building tools to build a press like this. 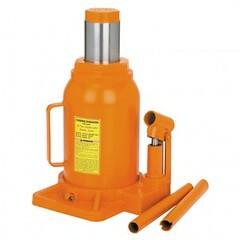 This type of press is great for home builders who want to use local materials that can be bought from most hardware stores. It works great for building boards from plywoods like 1/8″ Baltic Birch. You will need a jig or bandsaw and an electric drill. Ryan Snider, RS Skateboards built the mold above. Chudibap has a great build tutorial on YouTube showing how to build the above mold. Will last for many boards. Great if you want to duplicate a shape. Works well for boards made from plywood. Basic tools need to build the press. 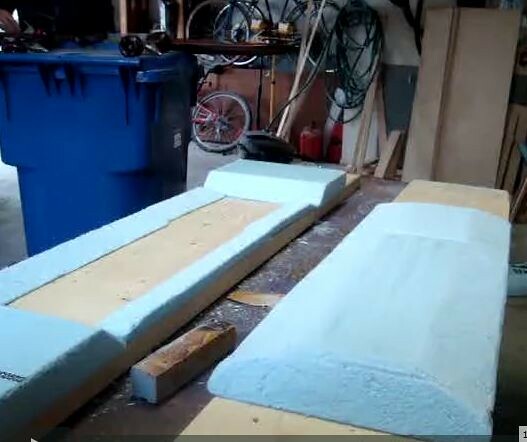 A friend from Montreal came up with the idea of using foam in a simplified 2 part mold to press longboards. The “Dimm press” is very popular with beginner boardbuilders. Build with locally bought materials. Works well for building Baltic Birch boards. 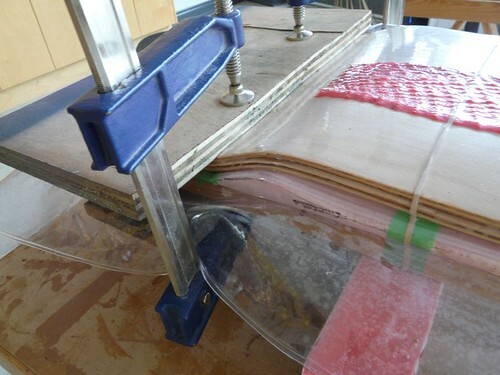 These types of presses are great for beginner skateboard builds using Baltic Birch plywood as they depend on the rigidity of the plywood to even out the amount of pressure needed to glue the materials together. 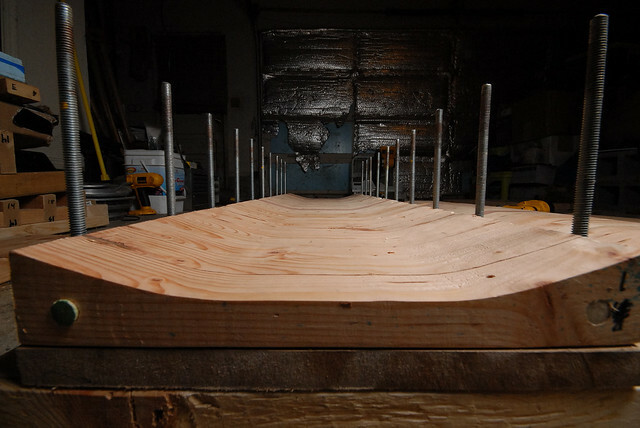 Most people use 1/18″ or 1/4″ plywood to build their boards from. The material needed to build this board press with is easily found at any lumber store like Lowe’s and Home Depot. Inexpensive if you already have clamps. Materials can be bought locally. Presses are easy to build. Works well for building boards from Baltic Birch plywood. This is our patented method of using a Styrofoam, one-sided mold in a vacuum bag to build a board. Typically this method uses a manual, electric or venturi vacuum pump as a vacuum source to evacuate air from a sealed bag forcing atmospheric pressure to act as a clamp to press multiple layers veneer together into a skateboard shape. Shaping foam is a relatively simple process and one that has made it possible for builders to build complex shaped skateboards. There is lots of information on this site, in tutorials that show all you need to know to get started. Styrofoam molds are light-weight and easy to to store. Styrofoam molds are easy to modify. More complex shaped boards like drop boards can be achieved by adding addition mechanical clamps to your pressing. Have to be careful when handling vacuum bags as they will rip or be punctured if not treated with care. Removing veneer from bag to quickly or dragging bag over a workbench can easily tear a hole it it. There are many different types of boards you can build using a Thin Air Press. The learning curve for vacuum bagging complex board can be high. It is best to start with a simple shaped board, learn the timing of the process and then go on to build more complex shapes. 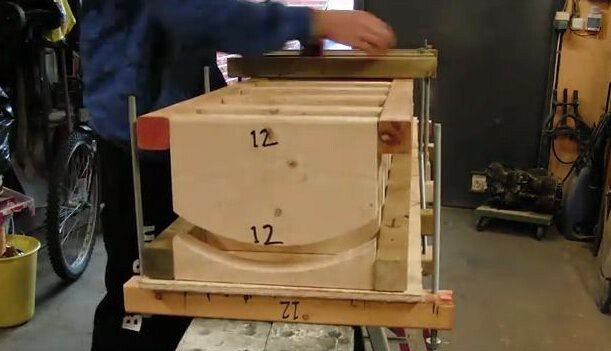 Almost all boards can be shaped using Styrofoam as a mold. Learning how to shape Styrofoam (extruded polystyrene) into a mold is relatively simple but knowing what shapes work and what do not, will take time to figure out. 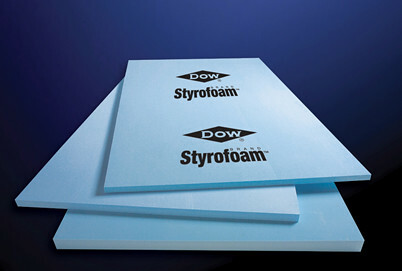 Styrofoam for board building can be bought at almost all Lowe’s and Home Depot. You will have a difficult time finding it in California and Texas where the laws prohibit its sale. Its main use is for house insulation and comes 2′ x 8′ in 1″ or 2″ thicknesses. It will be either pink or blue in color. Styrofoam work in a vacuum bag because the density of the foam is high enough to withstand the pressure exerted on it by the vacuum bag. What we use is Foamular C300 for all our custom board molds. 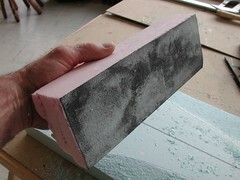 Styrofoam is easily cut with a long utility knife and can be shaped using hand tools like a Surform and sanding block. For sanding I glue 100 grit sandpaper to a scrap of 2″ foam. Make it around 4″ x 12″. This works well for final shaping of your mold. Accurate drawn guidelines, before shaping is a must to keeping your mold uniform. I use a black marker, straight edge and tape measures to keep things accurate. Most of the time working with the mold is taken up in the drawing process. Cutting the shape takes little time once you learn how to use the tools. The more accurate your mold is shaped the better your board will be. Styrofoam is flexible. A good way of putting camber into a deck is to, after you have vacuumed a small amount of air from your pressing, place a block under one end of your TAP bag, Depending on the amount of camber the block can be varied thicknesses. Vacuum the remaining air from the TAP bag, pressing down firmly at the pump, bending the mold while evacuating the air. Once the air is removed the pressure will hold the bend of the foam. Here is a video that shows the process. This saves a lot of time hand shaping camber into a mold. Two inch thick foam if you are bending extreme shapes can distort the Styrofoam at the bends. This will happen when the rigidity of the veneers is greater than the rigidity of the foam. A quick fix for this is to cut a piece of 3/4″ plywood to the same shape as your foam mold and place it under the mold, inside the TAP bag while pressing your veneers. Make sure the sheet of plywood is straight as any deformation will transmit to your finished board. *Our Master Deck Kits are designed to teach/learn the vacuum laminating process without wasting materials and time by providing all the materials, tools and illustrated instructions in one box. 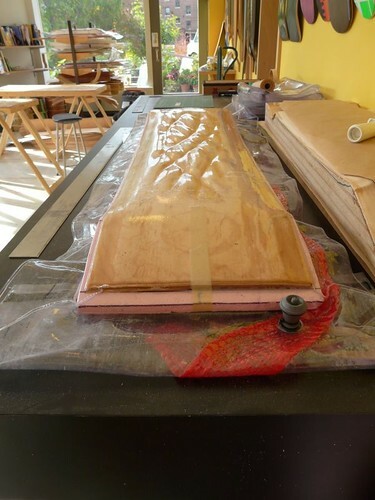 I have been thinking about making longboards but I did not really like the idea of using vacuum bagging or handmade wood presses. I have 22 ton log splitter that I could weld a jig for to fit different molds for and than sandwich the veneer between, a lot like the industrial process. I was wondering if anyone has tried this before, an also if anyone could critique my idea and express any concerns they have of it. Go to Roarockit.uk,they have a Facebook page also. More local help is always better. Rail presses only work on plywood. 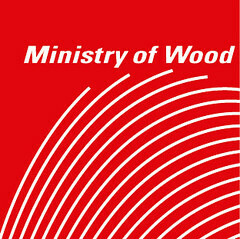 If you have solid 1/8″ veneer, not sure where you would buy this it will likely not work for you. How long are you leaving the decks in the press? How long have you had the veneers? Let your veneers acclimatize to there environment before pressing. Invert the cupping of the veneers as you laminate them while gluing. Use a roller and make sure you have even distribution of glue on each layer. Do not use too much glue. Look at our videos on glue application. Keep away from any heat source like sunshine or a heater. Leaving decks in press 12 hours using type bond 3 glue with a room temp of 70deg; we’ve had the veneers about 6 months; we are using a space heater, but not directly on the veneers…we may be using too much glue? Your veneer is also old but probably not the problem although it could be dried out. You can also phone Roarockit anytime with questions regardless of where you bought your veneers. Probably bought them from us but not sure. I have been skating since I was 5 , now age 43 and still skating, I would like to press my own decks. I like your vacume idea, but would like to build my own press. Question is, can you point me in the right direction in finding a mold. Could use any advice.